There are several conflicting stories told of Medusa: two of supposed historical account, and one of myth. In all accounts, she is an imposing and powerful feminine character. 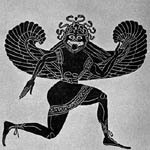 She is generally thought to be the daughter of Phorcus, and she somehow came into conflict with Perseus. Pausanias speaks of the historical accounts, first suggesting that Medusa reined over Lake Tritonis, leading the Libyan army against Perseus until her assassination (1). The second account tells of the wild men and women in the Libyan desert. It is supposed that one such wild woman wandered to the edges of Lake Tritonis, hassling the inhabitants until, again, Perseus killed her (1). The myth of Medusa is more widely written than these vague historical accounts. Medusa is one of three Gorgon sisters. Apollodorus suggests these Gorgons are monsters, with dragons scales upon their skin, swine tusks and golden wings. All three can turn people to stone, but Medusa is the only mortal among them (3). Most early images of the Gorgons support this description. 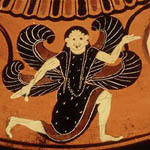 Ovid, a Roman, also points out that of the sisters, only Medusa has snakes as hair (this can be seen in Greek pottery) (9). He claims that Medusa was once beautiful, her hair her greatest charm. She was raped by Poseidon while worshipping in Athena's temple, and in a fury Athena cursed Medusa with reptilian hair (9). However, Hesiod writes that Poseidon and Medusa coupled in a meadow, among the flowers (6). 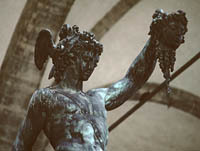 Medusa's life culminates when Perseus decapitates her as she sleeps. 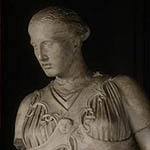 Apollodorus notes that Medusa believed herself to be more beautiful than the goddess Athena, and it was this reason that Athena sends Perseus after Medusa. As blood spouts from Medusa's neck, her children from Poseidon, Pegasus and Chrysaor, spring to life (3, 6, 9). Her Gorgon sisters then give chase to Perseus, but Perseus escapes with Medusa's head. The head of Medusa is still powerful, and continues to turn those who behold her face to stone. There are various stories of those men stoned (Polydectes 4, Atlas 9). The plants themselves are subject to the power of her gaze, and because of this Medusa is credited with the creation of coral, the living rock (9). Even the blood of Medusa has power over life and death. Blood carelessly cast by Perseus into the Libyan desert caused uncountable serpents to spawn from the blood soaked sand (8). Blood is also given to a surgeon, and this grants him the power to raise the dead or to cause immediate death (5). Eventually, Athena mounts Medusa's head upon her shield (4), though some statues and images show it mounted upon her chest.